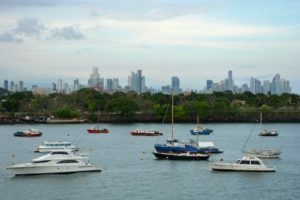 Our Panama Canal cruise guide gives you information about what to see when transiting the Panama Canal by cruise ships. For the last 100 years the Panama canal has served as a maritime shortcut. This 80 kilometer / 50 mile long waterway connects the Atlantic and the Pacific Ocean without having to sail all the way around the southern tip of South America. The canal uses a system of locks that operates as water elevators to raise vessels 26 meters / 85 feet above sea level. Through the fresh waters of Panama ships can make their way to the other side where they will be lowered again back to sea level. Passing through all of these different stages makes any transit by cruise ship a special experience which should always be on your cruise bucket list. The original Panama Canal The current canal was officially opened on August 15th 1914. Since it’s opening more than one million ships from all over the world have sailed the canal. 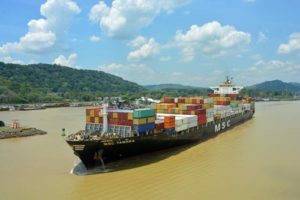 When the canal was build the maximum width of ships being able to go through was 33,5 meter thus officially establishing the “Panamax” for ships around the world. For over a century almost every ship in the world would not exceed the Panamax. 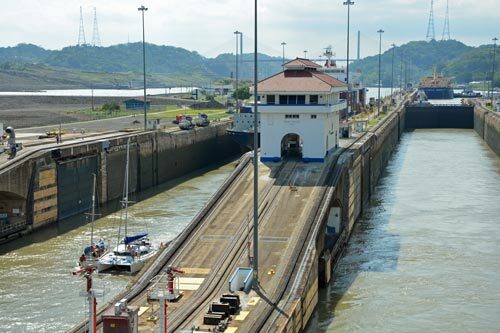 Although the world was ready for bigger ships, the Panama canal was not. Therefore plans were made to create a new canal with a wider span: 55 meter. The new Panama Canal The new panama canal will open up in juni 2016. 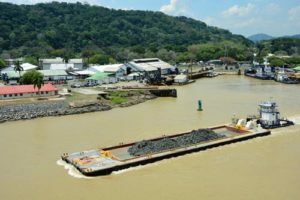 This $5.25 billion expansion project started in 2007.. For the last 9 years Panama has been working on a new canal where larger ships are able to go through. The new canal will be able to handle cargo ships carrying 14000 20 foot containers. This is nearly three times the size it can currently accommodate. With the opening of the new canal the new Panamax is being established changing the future of the cruise and maritime industry. The old and new canal will both be operational after the opening of the new canal. Cruise ships larger than the original Panamax obviously pass through the new canal whereas other cruiseship from now on have to confirm a preference with reservation on wether they want to pass through the old of new canal. The new locks have been build parallel to the old locks. The rest of the route remains the same. A transit through the canal typically takes around 10 hrs. Hours may vary because the speed of your cruise ship will be determined by the canal authorities and pilots. In the early morning 3 pilots will board te vessel the get your cruise ship through the canal. 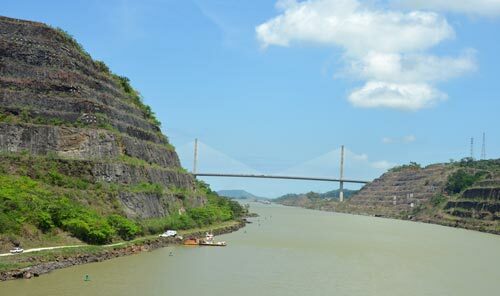 Usually a speaker of the Panama Canal will also board te vessel to give scenic commentary as you go through the canal. A. Entering the Panama canal at Christobal and leaving the Caribbean sea. This is where you pick up the local pilots and narrator. B. Pass through the Gatun locks. This is where the cruise ship will be elevated 26 meters / 85 feet above sea level. If your cruise ship passes through the new canal your ship will use the locks parallel to the old locks. C. Sail over the Gatun lakes which is a large fresh water lake through the Panamanian rain forest. 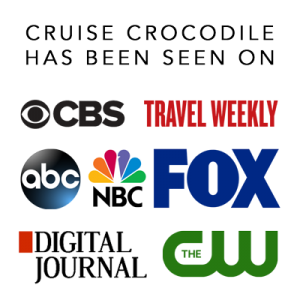 Keep your eyes open for pelicans and crocodiles. D. Gamboa is the half way point and headquarters of the Panama Canal dredging division. E. Sail through the famous Culebra Cut, also known as Gaillard Cut. This is where you will pass gold hill and sail under the Centennial Bridge. 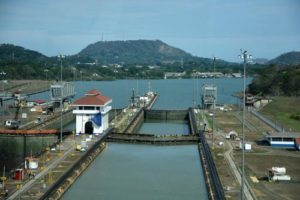 F. Pass through the Pedro Miguel Locks and Miraflores locks. If your cruise ship passes through the new canal you will just go through 1 set of new locks which runs parallel to the 2 older locks. G. You will sail under the bridge of the Americas and have a beautifull view over the skyline of the Panama city. H. Exiting the canal at Balboa at the Pacific ocean. If you are doing the transit from the Pacific Ocean to the Caribbean Sea you can obviously start at letter G and work up to A. You can share your experience in the canal with friends and family back home. 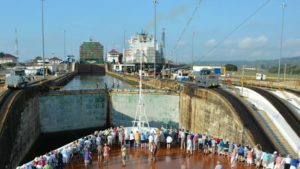 They can watch your cruise ship go through the locks via the live Panama Canal webcam. Click here to be forwarded to the webcam page. How much does it cost to go through? Tolls vary and are never public. It is know however that the most a cruise ship every paid to go through was 500.000 US dollar. Usually cruise ships state the price is between 100.000 and 300.000 US dollars, depending on the size of the ships and the number of beds on board. Reservation and transit fees must be paid in advance. Is there two way traffic in the canal? Yes, there is. However, ships usually go in convoy (Northbound and Southbound convoys) Each convoy starts at their end of the canal between 5 and 7 am. 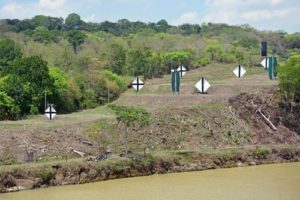 They pass each other half way on Gatun lakes and Culebra Cut.